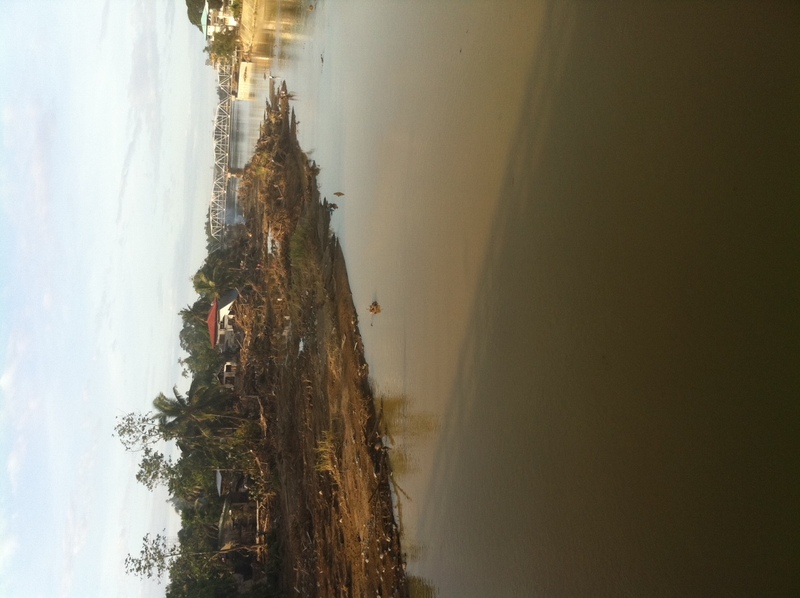 Driving from the airport to the Cagayan de Oro City does not instantly reveal the damages brought about by Sendong. The usual traffic is ever-present, the hustle and bustle of city life goes on. But then you come to the Rotonda Bridge and wonder why there are cars parked along the side of the road and people taking pictures, as if it was a tourist site. But it’s not a tourist site, it’s a disaster zone. 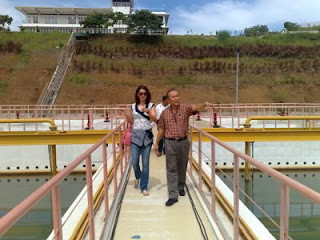 We are standing on the bridge that stands some 10 meters above the Cagayan river. The river is far below. But early Saturday morning, on December 17, 2011, the water rose with such fury that in a matter of minutes, it had passed the height of many one-storey homes and soon after rose higher than the bridge itself. The Western Central School I visited, is almost identical to the many schools that have now been turned into evacuation centers. When I went there, it was home to around 1,300 families. The teachers, Department of Social Welfare and Development (DSWD), local government officials and volunteers do what they can. But the close living conditions and lack of sanitary standards are a time bomb waiting to explode into a health epidemic. We know this story all too well. 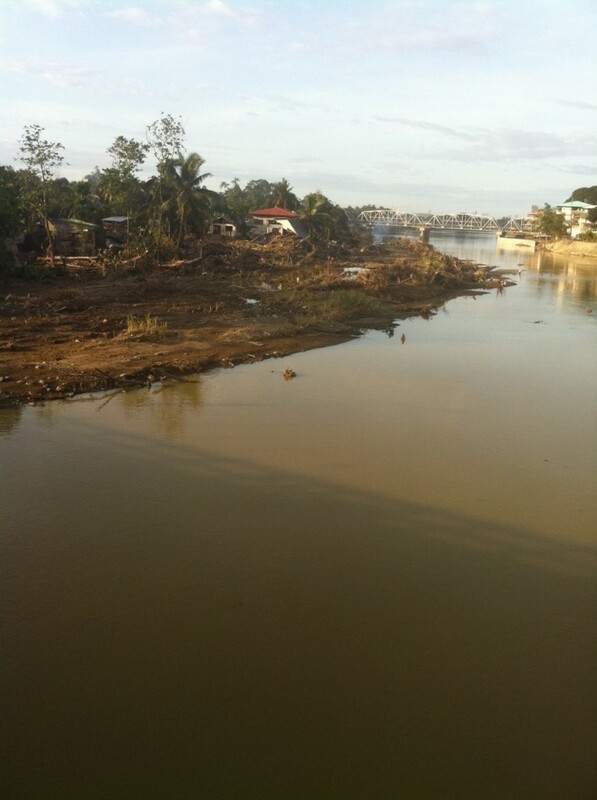 Disaster strikes, rescue mission are set in place, people are relocated to temporary evacuation centers. Then people start getting sick. Despite the good intentions of kababayans from all over the country and the world, there is still much that can be done to improve our disaster preparedness. One area, that has long been neglected is our water supply and sewage system. Water is a scarce resource all over the world. Many countries have already invested in developing a reliable water supply, read Singapore’s Water for all story. We should also seriously start looking at alternatives to our toilets that consume so much water. 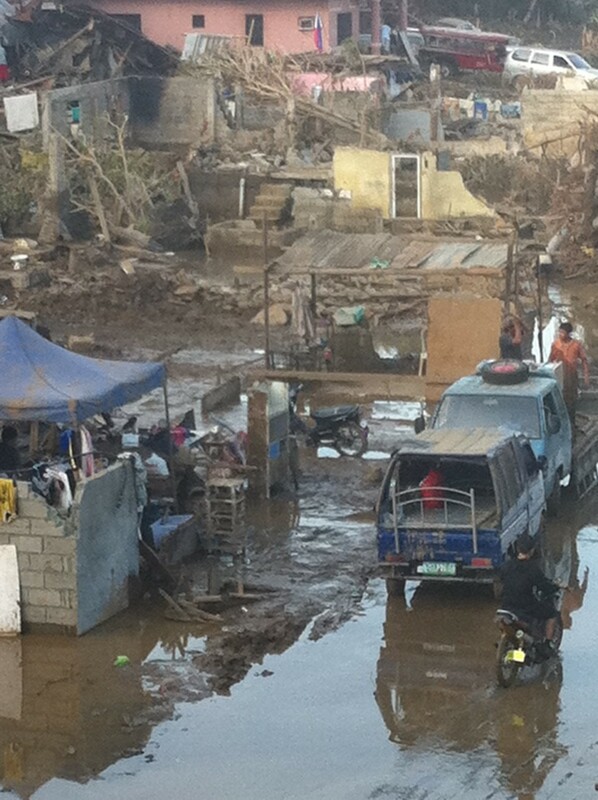 CDO is paralyzed without fresh water supplies. I made a call to buy CDO and Iligan products to support their rehabilitation, but I learned that many small and medium enterprises (SME’s) don’t have access to clean water and thus, can’t make their products. I’ve seen waterless toilets that work in the Fisherman’s Village in San Fernando, La Union. I am working on a bill to create a national policy on shifting to these kinds of toilets or some equally eco-friendly toilet in all public schools and other public facilities. Another issue close to my heart is nutrition. It starts with breast feeding. Every effort should be extended to promote breast feeding during disasters. Mother’s milk is the most nutritious and when her breast milk supply is affected, you cut off her baby’s lifeline. There are many health risks associated with the use of unclean water that goes into the preparation of formula milk and other canned milk products. Thus, breast feeding should be encouraged at all cost. Meanwhile, it’s Christmas. The basic rights of a child, include the right to play and a childhood. I wanted them to have a semblance of Christmas. While visiting at both Western Central and later at the Women’s Center, I read “The Christmas Lantern Trip” story to the children. It’s a story my mom wrote about our search for the perfect “parol.” After we read the story, I encouraged the moms who were there and the older kids to read to the younger kids. I left them a small library of books and had them promise to read every day. 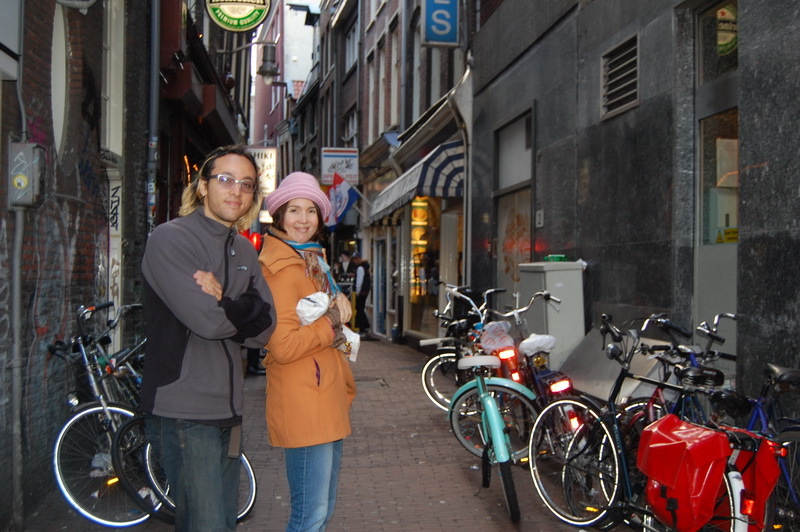 I also left them with an assortment of board games, balls and toys that they could play with both indoors and outdoors. Unfortunately, I didn’t have time to visit Iligan but my staff Faw Maridul is from there and will be going around to various evacuation sites and communities especially those that have not been well served by relief assistance yet. I have already requested for the release of P2.2 Million of my Priority Assistance Funds from DSWD for CDO, Iligan and other towns affected by Sendong. My brother Alan has also allocated the same amount for the affected areas. Hope lives on through the many people who do not forget CDO and Iligan, and through the volunteers who work day and night to maintain the evacuation centers – the teachers, DSWD officials, local officials. It is my fervent wish and prayer that we all learn from this unfortunate tragedy and together, work towards better disaster prevention and preparedness if we can’t altogether prevent it by being more conscientious of the human activities that contribute to these kinds of natural calamity. 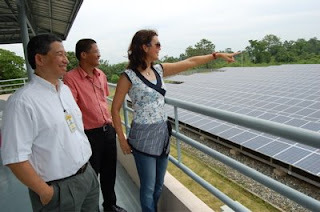 During my trip to Cagayan de Oro a few months ago, I visited the CEPALCO Solar Power Plant, the largest solar power plant in Southeast Asia. It currently serves 900 households in the area. I was surprised how simple it all seemed. As you can see in the pictures, it is simply a large number of solar panels laid out on 2 hectares of land. The sunlight that hits the solar panels are immediately converted into AC voltage and then transmitted to the power grid for distribution. The Renewable Energy Bill is one of the priority measures in Congress. 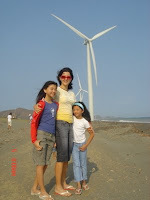 I am one of the authors and as such, I have been studying different kinds of renewable energy. Solar power, like other renewable energy is great because it is environmentally friendly. The problem is the high cost involved. Because of this, solar power is either subsidized or users have to pay a premium. Many are of the view that it is well worth the price, given the savings in environmental and health costs associated with the use of fossil fuel. 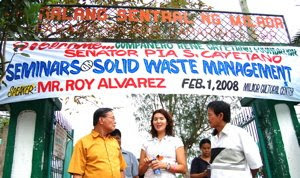 My staff along with Mother Earth Foundation held a solid waste management in Barangay Carmen. Participants came from different sectors ”barangay officials, students, business establishments etc. I arrived in time to give a pep talk, answer a few questions and witness the action plan signing wherein each group/sector commited to carry thru the action plan they had written out. Their enthusiasm was contagious. I told them I hoped to see their plans materialize the next time I visit CDO. 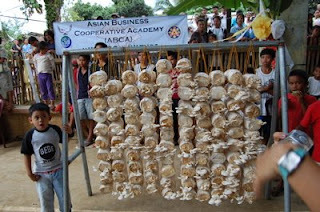 The surprise of this working visit was a stop at the Asian Business Cooperative Academy where I learned about one of the livelihood projects of the students “ the flurutus mushroom which are grown in cylindrical shaped containers filled with sawdust. All one has to do is sprinkle them with water a couple of times a day, wait for them to grow and harvest them. The next batch automatically grows back. I took home some and am hoping they we can harvest our mushrooms soon! Clean water is a big problem in our country. Based on a survey of NSO, only about 80% of Filipino households have access to clean water. This means, 17 million Filipinos use and drink water that could make them sick. from Mt. Kanlaon is purified through a few touches of the computer. 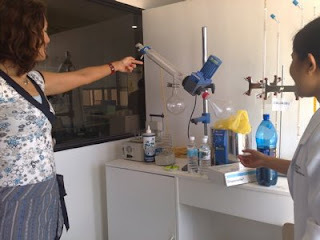 They walked me thru the whole process of receiving the water, flocculation, sedimentation, filtration and finally — clear water ready for distribution. I am told that this meets the WHO standards for drinking water. We hope to see more programs like this. Worms were not part of my agenda in going to Dumaguete. 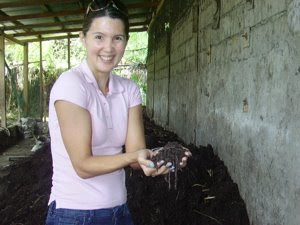 But it found its way into my schedule after City Mayor Agustin Perdices and Governor Emilio Macias III, each told me how they are using worms to create organic fertilizer. The process is fairly simple: Mix manure, organic products like leaves and a handful of worms in a big sack. The worms eat and excrete and in a few weeks, voila, you have organic fertilizer. The goal is to get more farmers to make their own organic fertilizer instead of buying commercial fertilizers which are much more expensive and have chemical ingredients. But I jump ahead of my trip. My staff actually had been there for the last three days conducting seminars on breast feeding and women empowerment. I arrived on a rainy Saturday afternoon. Aren’t rainy Saturday afternoons just perfect for going to sleep? But this was a working Saturday for me and I was scheduled to meet the governor and get a tour of the provincial hospital. The governor, it turns out is a PGH trained surgeon, a passionate healthcare advocate who shared a lot of his ideas about devolved health care, its problems and possible solutions. It was great to meet him and the medical staff of the hospital. I hope to use their experiences in reviewing our health care policies. From health care Negros Oriental style, I got a taste of women power, Siliman University style. I met their student council, headed by SC President Stacy Danika Sia Alcantara. Wow! What an energetic talented group of young women, to say the least. They proudly told me that their school is very gender sensitive and has always had a strong women studies department, that the young men who enter the University are soon enough indoctrinated into a lifestyle that is gender equal in all aspects. More power girls. I promised to write a future entry on women empowerment and the girls promised to contribute? Later that evening, I met with Green Alert Negros, who expressed their concern about the plans to cut thousand of trees and develop part of Mt Kanlaon as a source of geothermal energy. I actually climed Mt Kanlaon years ago and was quite familiar with the affected area. But more importantly Mt. Kanlaon is a natural park protected by law, rich in biodiversity and is home to many endemic species. 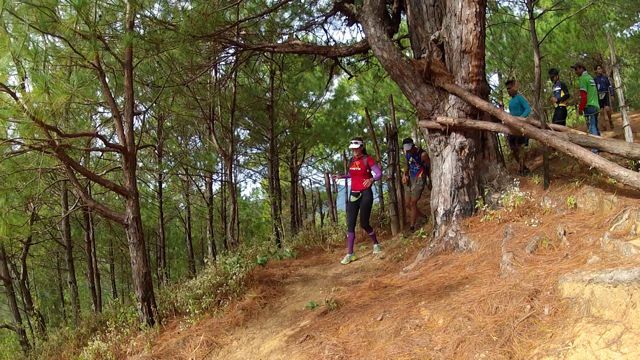 Next day, I woke up to a dark morning, with tree branches swaying from the strong winds.. It looked like rain was inevitable, but in fact, shortly after 5 am, the sky started to lighten up.. Ani and I ran straight from our hotel to the starting line where we joined thousands of runners who like us, got up at dawn for the fun of running in one of the 3 distances of the Milo Maratthon series –3k, 5k and 21k. 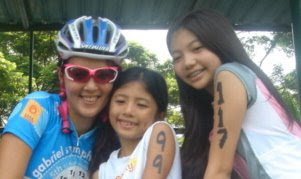 I joined the 21k run which took us along Rizal Boulevard, right by the Tanon Strait which was a beautiful site. Then we turned into a side road and went thru very pleasant countryside, where the locals lined the streets to watch us go by. The exciting part of every run for me is seeing the strong women runners race. 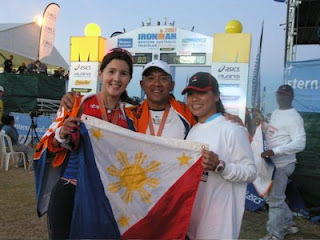 We had a chance to chat after the awarding ceremonies. 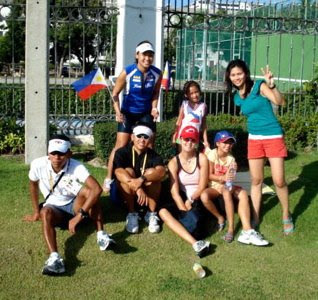 They come from all backgrounds, mothers, students, teens and women in their 40s, all fast runners who outrun most men! In just about 24 hours from the time I got to Dumaguete, I was homebound. I didn’t get much of a chance to explore the beautiful city, but thanks to the local government officials, the locals, my staff and everyone who gave us some of their valuable time, we had a productive and fulfilling trip. Finally a road vehicle that excites me…I’m not into cars..fast cars, slow cars, they don’t really matter to me.. I cant distnguish one brand from another. 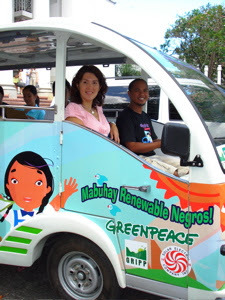 I describe cars by their size and color..
As I was leaving the provincial capitol of Negros Oriental in Bacolod City, my staff reminded me that to get to my next meeting, I would be riding the latest jeepney to hit the streets of bacolod.. I should mention at this point, that if there is any public utility vehicle that would pique my curiosity it would be the jeep. For one, I love looking at the art work found on the sides of jeepneys, especially the very colorful ones and those that depict images related to our culture or beautiful places in our country. And second, as a child, my mom used to take me to the Intercon Hotel jeepney coffee shop where we would sit in the jeep and eat merienda..
Its called the E-Jeep. 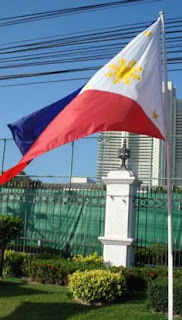 Its a joint project of the Green Renewable Independent Power Producer, Inc. (GRIPP), Greenpeace and Solar Electric Company. Here’s another exciting bit of info about this jeep and the vision of the groups behind the e-jeep. The intention is to use energy from biodegradable waste from the city’s wet markets to power not just the jeep but an environmental-friendly mass transport system. So, we address the problem of air pollution and solid waste management at the same time! 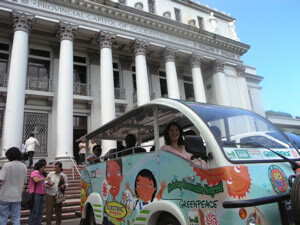 At present, the e-jeep is being test run in Bacolod and Makati. Since it only runs at 40kph, it is meant to ply small busy roads where the speed is usually slow anyway. Perfect for commuters inside a subdvision or short destinations. For efficient operations, we are told that the plan is to build stations where the jeeps can be charged, so instead of gas stations, we will have charging stations..
Needless to say, I enjoyed my short but extremely pleasant jeepney ride. Oh, by the way, it also is super quiet. No rumbling engines, no noisy tambutso! I am really hoping to see more innovative environment-friendly projects like this. Next thing you know, you’ll be calling your mom or boyfriend and saying, sorry Im late, no low bat yung jeep na sinasakyan ko!